The first goal of the field season was to determine the relationship between the scarp itself and the Pastos Grandes Ignimbrite . Questions regarding the area revolve around the age of the scarp. 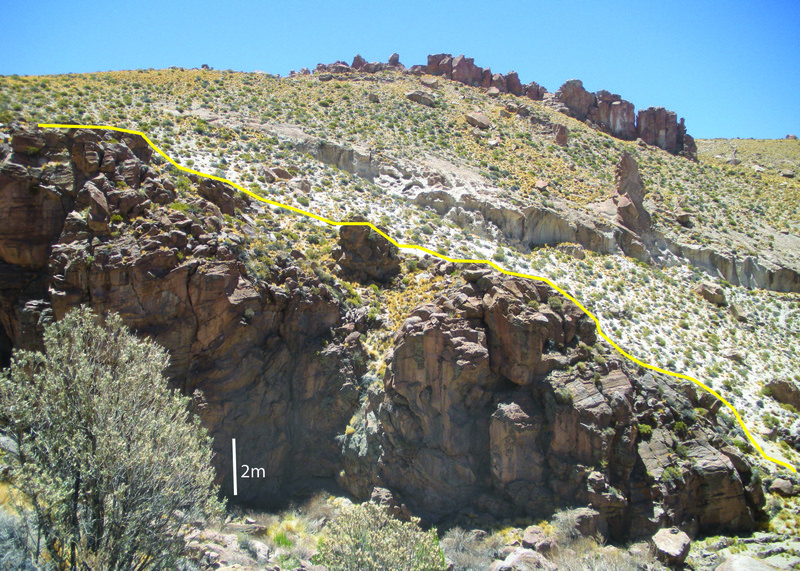 Is the scarp a remnant of the Chuhuilla Ignimbrite eruption , or is it the age of Pastos Grandes? In the field, the goal was simply to determine the contact relationship; the exact age of the scarp will be determined by age dating techniques in the lab. An excellent contact relationship, shown below. can be found just west of the town of Villa Mar. In the Pastos Grandes Ignimbrite, pumice is rare but found to have phenocrysts quartz, plagioclase, biotite, and sanidine (Salisbury et al., 2010). The intracaldera facies commonly contains dense juveniles, and fiamme. A view West towards the collapse scarp. From this vantage point the scarp lavas can be seen through a small canyon cut in the Pastos Grandes Ignimbrite. Looking North at the scarp lavas which are covered by the outflow of the Pastos Grandes Ignimbrite. A yellow line highlights the contact. Looking East from the collapse scarp through a valley cut in the Pastos Grandes Ignimbrite. From here the entire outflow facies is visible (all 100m in this location).